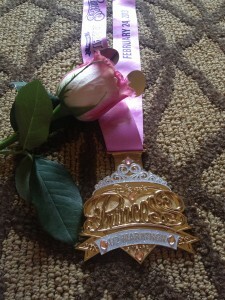 I participated in my first Disney’s Princess 1/2 Marathon on February 24th. 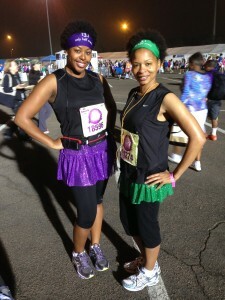 I have been in other runDisney events and enjoyed them. The decision to participate was made after Sara (@DisneySara) and I completed The Twilight Zone Tower of Terror 10 Miler last year. 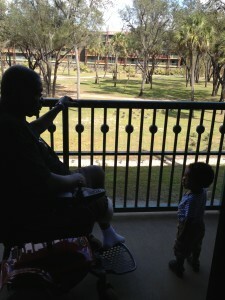 I arrived in Walt Disney World on 2/21 with family in tow. The family consists of my parents, sister, and my 15 month old nephew. This trip was more than participating in a race. It was my nephew’s first trip and my father’s first trip since having major surgery last year. My sister suggested we stay at Animal Kingdom Lodge. I was able to secure us a one bedroom villa in Kidani Village with a savannah view. I loved going on the balcony to watch the animals. Due to my sister and I being planners, we knew we had to be at the Disney’s Fit for a Princess Expo before it opened on 2/22. Animal Kingdom Lodge was a host resort and a bus would be available to take us to the expo. Since the expo was held at Disney’s Coronado Springs Resort, no cars would be allowed and there were no exceptions made. From the bus I could see Cast Members checking cars attempting to come into the resort. If you were not a guest, you were turned away. There was confusion when entering the expo due to three lines being formed and different explanations of what the lines were for. 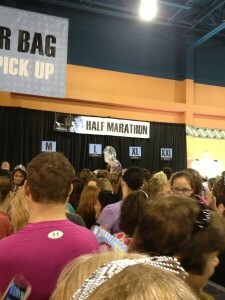 I was told two lines where for Packet Pick-Up and one line was for the New Balance runDisney tennis shoes. I made my way over to the New Balance line and waited. We were walked into the expo and formed a line outside of the New Balance booth. The line was moving slowly due to the registers not connecting to the internet at first. An employee stated there would be two pair limit per person. As I moved closer to the entrance of the booth, the same employee was counting people in line and asking how many pairs a person was going to purchase. That made me nervous and I crossed my fingers my size would be available. 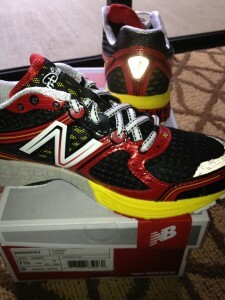 I think I waited a little over an hour for my chance to step into the New Balance booth for my shoes. Due to me being a Mickey Mouse fan, I wanted the men’s shoe. I had gone to a sport store before the expo to try on a pair of New Balance in order for me to have a general idea of my size. I would take a 7 in a man’s size but the smallest they had was 7 ½. The 7 ½ fit due to the shoes running small. With my tennis shoes in hand and $124.99 (before tax) later, I was skipping to get my race bib. 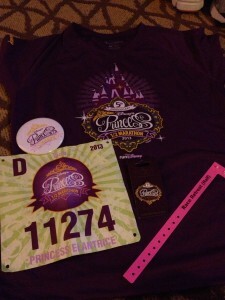 I had no issue getting the bib and wristband for the Race Retreat. The line which I thought would be the shortest and quickest turned out to the most chaotic part of the expo. It was the area to get the goodie bag and t-shirt. I was pushed from all sides in an attempt to make it to the front to get the items. 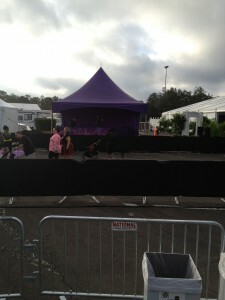 When I arrived at the expo later in the evening, stanchions where placed in this area to control the crowd. 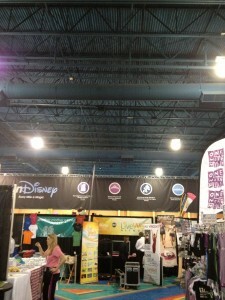 I also had the chance to enter the Official runDisney Merchandise area. 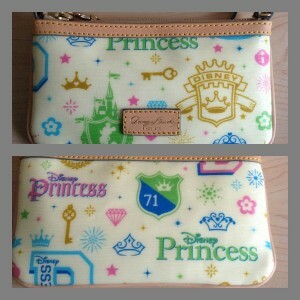 I purchased 2013 runDisney Vinylmation, the Princess Marathon medal for the Vinylmation, and Princess Marathon Dooney & Bourke wristlet. 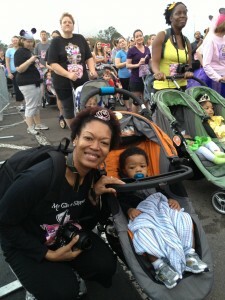 On 2/23, my sister and nephew participated in the Stroller Division of Mickey and Minnie Mouse Royal Family 5K. I think they both had fun. 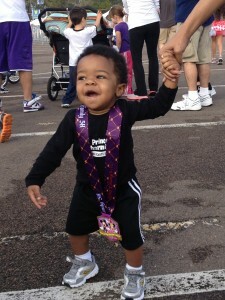 My sister allowed my nephew to walk across the finish line. 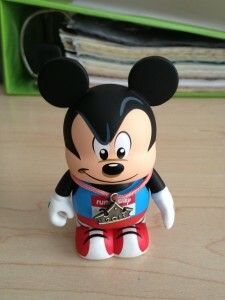 He earned his first runDisney medal. 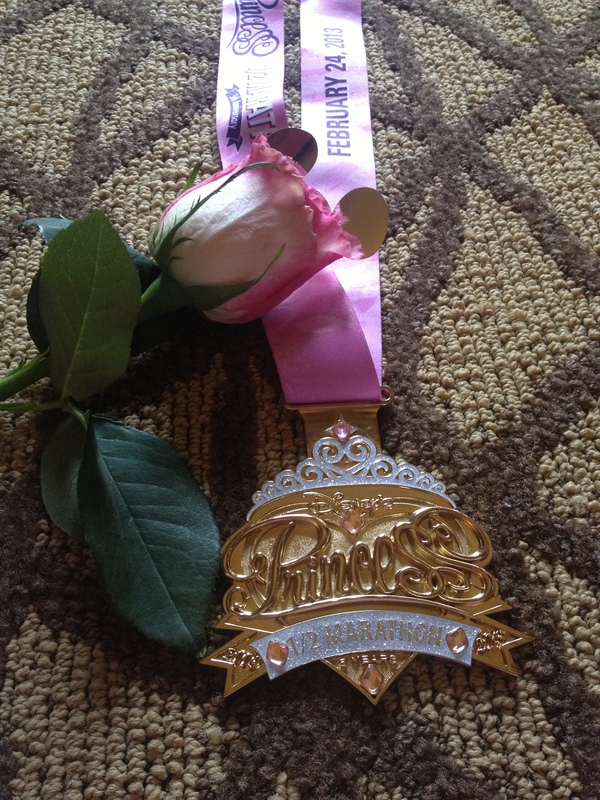 The next morning was my race…13.1 miles. 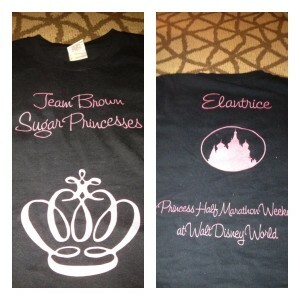 I had traveled this course before during Walt Disney World Half Marathon. I was nervous due to me not training properly due to lack of motivation. I ran and walked the course. There is nothing like running through the castle and having people cheer for you. 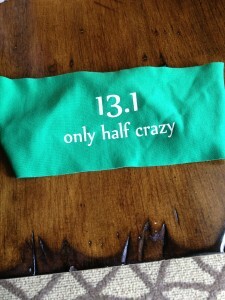 I finished the half marathon in 3:19:48. Now just imagine what I could of done if I had trained like I should. After getting my medal, I made my way to the Race Retreat. I did not have a lot of time to spend here before the race. Before entering my corral I had a bagel and cream cheese. I made sure to go back there for breakfast, which consisted of eggs, hash browns, bacon, oatmeal, fruit, coffee, muffins, cinnamon rolls, Powerade, and water. 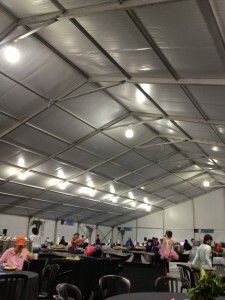 There were several tables set up under a large tent. 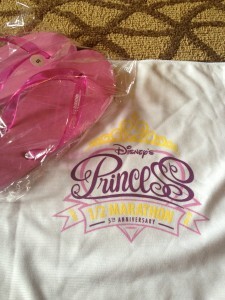 Race participants were given pink flip flops and a towel. I would pay for the Race Retreat again and make sure I participate in the offers before the race. Members of the Platinum ChEAR Squad were allowed in the Race Retreat after 5:30am. My sister paid for this package since she would have my nephew. 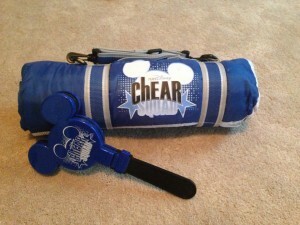 The Platinum ChEAR package include a t-shirt, stadium blanket, Mickey clappers, access to the cheering section at mile 5.3 in front of Cinderella’s Castle (with coffee and water), and access to the Race Retreat. 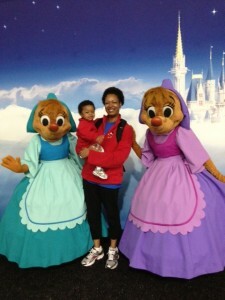 She stated they both enjoyed themselves by taking pictures with characters and playing in the Kiddie Corner. Well this sums up my Princess weekend. I must say I did not have a chance to spend much time in the parks or attend several meet-ups. I felt so rushed with everything going on. However, I did take the take to enjoy my family especially watching my nephew enjoy my Happy Place. Great recap! I’ve added your link to our post! 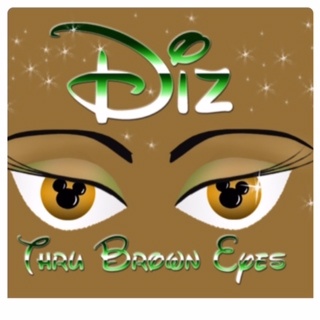 Thank you for reading!!! You guys encouraged me to sign up for the Race Retreat! !